and I, a fish inside. after such a long night’s journey. so you can find you. 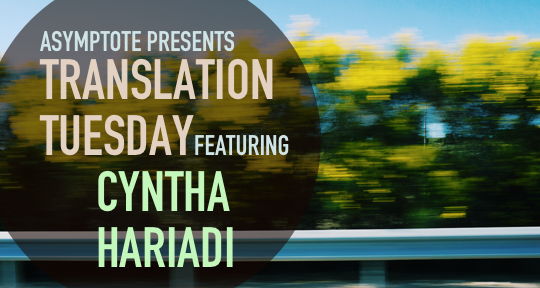 Cyntha Hariadi is an Indonesian writer of poetry and short fiction. A graduate of the New School for Social Research, her first book of poems, Ibu Mendulang Anak Berlari [Mother Feeds, Child Flees], won third prize in the 2015 Jakarta Arts Council Poetry Book Manuscript Competition. She also has a book of short fiction, Manifesto Flora [Flora’s Manifest], and is currently writing a novel. Norman Erikson Pasaribu is an Indonesian writer, translator, and editor. Tiffany Tsao’s English translation of his first book of poems, Sergius Seeks Bacchus, received a PEN Translates Award and is forthcoming from Tilted Axis Press. This is his first published translation of an Indonesian literary work into English.